Los Angeles typically has year-round good weather for bicycling. However, it definitely lacks the infrastructure that allows bicyclists to ride safely in all parts of the city. Apart from roadways that lack bike lanes and wider shoulders that allow bicyclists to operate safely, the increase in distracted and negligent driving has made it exceedingly dangerous for bicyclists on the streets of Los Angeles. These incidents of distracted driving can lead to accidents, and that’s where our Los Angeles bicycle accident lawyers come in. Bicyclists, more than drivers of other vehicles such as cars and trucks, are more vulnerable and suffer catastrophic injuries such as brain trauma and spinal cord damage. These are debilitating injuries that can leave individuals with lifelong disabilities. If you or a loved one has been injured in a Los Angeles bicycle accident, or if you have lost a loved one in a bicycle accident, it would be in your best interest to retain the services of experienced Los Angeles bicycle accident lawyers who will help fight for your rights and secure maximum compensation for your injuries, damages and losses. According to recent media reports, bicycle-involved traffic fatalities in Los Angeles have tripled in 2018. In the first four months of 2018, six fatal bicycle accidents were reported in the city, up from two such fatalities during the same period in 2017. All of the deceased were cyclists. The six fatalities this year also included multiple hit-and-run collisions in South Los Angeles. One involved a FedEx delivery van that allegedly fled the scene after fatally injuring a woman on a bicycle. While serious and fatal traffic injuries were down 10 percent in 2018 compared with 2017, bicycle accidents continue to trend high in Los Angeles and show no signs of presently slowing down. Under California’s vehicle code, bicyclists have the same rights and responsibilities as drivers of other motor vehicles. However, a number of accidents occur when motorists fail to acknowledge bicyclists’ rights. A lot of these tragic bicycle accidents happen because drivers don’t notice bicyclists, fail to share the road with them or fail to yield the right of way to bicyclists. Here are some of the laws that apply to bicyclists in Los Angeles. Staying on the right: Bicyclists are required to ride as close as possible to the right side of the road. There are, of course, exceptions to this law such as when you are preparing to make a left turn, avoiding a dangerous condition on the roadway such as a pothole, or if the lane is too narrow. Bike lane use: A bicycle lane is a designated lane for bicyclists. Staying in this lane helps separate bikes from the rest of the traffic. Bicyclists are required to stay in the bike lane unless they are making a left turn or avoiding a road hazard. Riding direction: Even though this is a topic that is often debated, California’s bicycle laws clearly state that bicyclists must ride on the right side of the roadway in the same direction. This law does not apply when you are riding on one-way streets, roads that are not wide enough, while passing or making a legal left turn. This law also doesn’t apply when the right side of the road is closed due to construction activity. Riding on sidewalks: The law is open to interpretation when it comes to riding on sidewalks. This is because bicyclists are neither allowed to nor prohibited from riding on sidewalks. The law, on the other hand, allows cities and counties to determine this issue. Riding on sidewalks may come with its own set of risks including getting hit by vehicles that pull out of driveways. Drivers, however, do have a responsibility to make sure there are no vehicles passing by before pulling out of driveways or turning into driveways. If a sign hasn’t been posted prohibiting bicyclists from riding on sidewalks, it’s safe to assume that it’s legal to do so. Bicycle helmets: All bicyclists under the age of 18 in California are required to wear a helmet on a public roadway, bike way or trail. This not only includes the person who is riding the bike, but also any children or passengers who are riding in restraining seats or those being towed behind the bike. Helmets must meet the state’s certification standards, must be fastened at all times, and fit properly. Electric bikes: There are a number of electric bikes that are popular. Most are simply bicycles with attached motors traveling at speeds of 20 mph or so. Electric bikes are not allowed on freeways. Cities and counties prohibit these bikes from being ridden in some parts of the city including bike lanes or bike ways. California’s Three Feet for Safety Act, which was passed in 2014, requires drivers to stay at least three feet from bicyclists while passing. If traffic is too heavy to switch lanes or if other conditions such as construction work make this three-foot buffer impossible, the law requires drivers to slow to “a reasonable and prudent speed” and wait to pass until the cyclist is safe. Before this law went into effect, California drivers were required to pass bicycles at “a safe distance.” However, the law did not clarify what that safe distance might be. A driver who goes too close to a bicycle could face a $35 fine. If a car is in the buffer zone and a crash occurs injuring the cyclist, the driver could face a $220 fine. There are a number of reasons why bicycle accidents occur in Los Angeles. Here are some of the most common causes of bicycle accidents. Distracted driving: There has been a spike in fatal auto accidents over the last few years nationwide and many studies attribute this rise to the use of smart phones and distracted driving. While careless driving has the potential to cause auto and pedestrian accidents, bicyclists are also in an extremely vulnerable position. 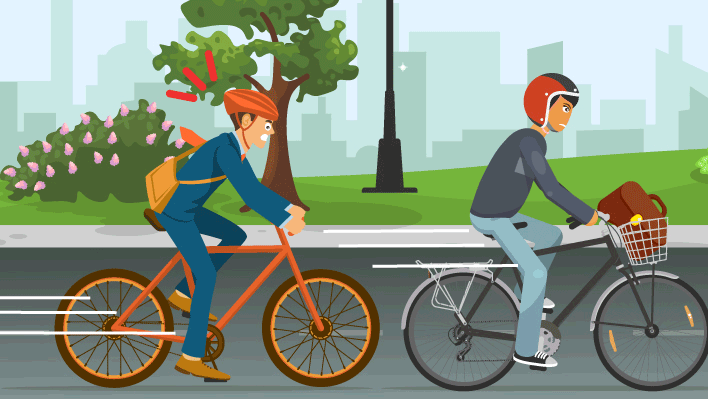 It is common to see bicycle collisions where a distracted driver veers off the roadway and strikes a bicyclist who is riding on the shoulder. Drunk driving: Impaired drivers also cause a number of catastrophic bicycle accidents in Los Angeles. These are also cases where drivers flee the scene after hitting and injuring a bicyclist because they don’t want to face drunk driving and/or other charges. Excessive speed: When drivers exceed the speed limit or operate at speeds that are unsafe given the roadway and weather conditions, they put bicyclists in grave danger. Excessive speed often leads to horrific crashes where larger vehicles rear-end bicycles. This could result in the bicyclist getting thrown off the vehicle or against the windshield of the striking vehicle. These are also the types of crashes that may result in deadly injuries. 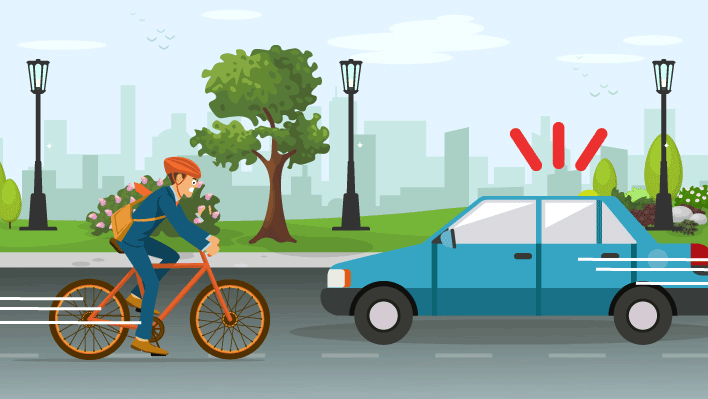 Failing to yield: Since bicyclists have the same rights as other vehicles, it is important for motorists to remember that they need to yield the right-of-way to bikes that are oncoming. Just as you would yield the right-of-way to an oncoming vehicle, you would also yield to an oncoming bicycle. 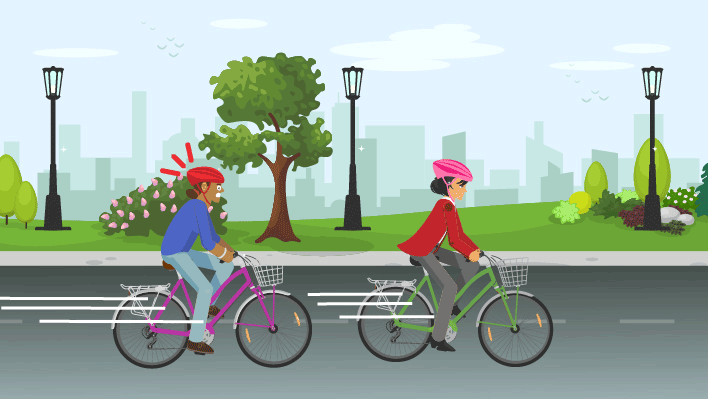 Failing to yield to bicycles at intersections often results in major collisions and injuries. Dangerous roadways: Bicyclists are certainly more vulnerable when riding in dangerous or poorly-maintained roadways and bike paths. Bicyclists face the risk of losing control while going over potholes or uneven pavements. When a roadway lacks adequate lighting or proper lane markings, bicyclists are in danger as well. When a dangerous roadway or intersection causes or contributes to a Los Angeles bicycle accident, the governmental agency responsible for designing and maintaining the roadway can be held liable for the victim’s injuries and losses. Defective bicycles: A number of major injuries from bicycle accidents are also caused by defective bicycles or faulty bicycle parts. Each year, thousands of bicycles are recalled for defects. Again, it’s important to preserve your bicycle after a crash so an expert can examine it for evidence including possible manufacturing and design defects. In such cases, victims can file a product liability lawsuit against the negligent manufacturers. Dooring: Bicyclists are often taught that the safest way to ride a bicycle is on a bike path. However, there are many locations in Los Angeles where cyclists are forced to ride very close to parked vehicles. Los Angeles, in particular, is notorious for not having well connected or well-marked bike lanes. 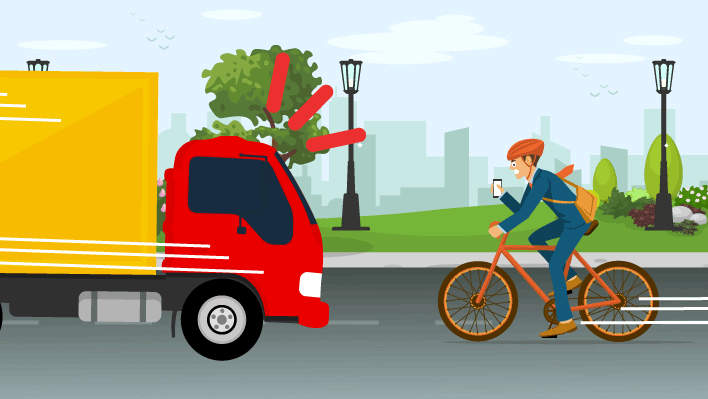 So, when motorists open their vehicle’s door without checking for an oncoming bicyclist, the cyclist could get struck by the door and suffer serious injuries just from that impact, or as a result of getting thrown on the street into the path of oncoming traffic. Under California Vehicle Code Section 22517, any vehicle occupant who intends to open a door on the side of moving traffic must only do so when it’s “reasonably safe to do so” and if it can be done without interfering with the movement of such traffic. If a vehicle occupant fails to check for traffic causing a bicyclist’s injuries, he or she could be held liable for the injuries and damages that occur. Dooring could result in major injuries including severe bruising, lacerations, road rash, facial injuries, broken bones, traumatic brain injury, spinal cord trauma, nerve damage and internal organ trauma. There are a number of steps you would be well advised to take if you have been injured in a Los Angeles bicycle accident. First, make sure you file a police report. This means speaking with the officer who responds to the accident scene. Obtain a copy of the police report for your records. If you are injured and unable to get a copy, your bicycle accident attorney can get it for you. Collect as much evidence as possible from the scene of the accident. Do not repair your bicycle right away. Preserve it in its current condition until a crash reconstruction expert can examine it for all possible evidence including vehicle defects and malfunctions. Shoot photographs and video at the scene including the damage to your bicycle and other vehicles, those who were involved in the collision, the roadway condition at the time, etc. Obtain contact information for anyone who might have witnessed the crash. Obtain prompt medical attention and treatment for your bicycle accident injuries. Do not put away treatment and continue to follow the doctor’s orders. Getting timely medical attention gives you a good shot at a quick and full recovery, and it creates documentation that details your injuries and treatments. Document all the income you lost as a result of not being able to go to work. Contact an experienced Los Angeles bicycle accident lawyer at once. Your bicycle accident lawyer will fight for your rights every step of the way and help you secure maximum compensation for your losses. • All medical expenses including emergency transportation services, hospitalization, surgery, medication, medical equipment, etc. • Rehabilitation costs such as physical therapy and chiropractic care, which are not usually fully covered by health insurance and must come out of pocket. • Lost income, which includes payment for wages lost due to your accident and injuries. • Loss of life’s enjoyment. • Lost future income, if your bicycle accident injuries resulted in you losing your livelihood or earning capacity. • Pain and suffering including physical trauma and mental anguish. • Loss of consortium typically filed by a spouse or partner who is unable to have intimacy with the victim after the accident. While it is natural to want to put this unpleasant episode behind you as soon as possible, our Los Angeles bicycle accident lawyers would strongly encourage you to not succumb to the temptation of accepting a quick settlement from the insurance company. When you do that, your claim may be considered closed and you may not be able to seek reimbursement for other expenses such as loss of future income and continuing costs of medical treatment and care that might occur later. You should also be careful about giving access to your medical and financial information. The experienced Los Angeles bicycle accident lawyers at TorkLaw are passionate about the pursuit of justice for our clients. We understand that this can be an extremely challenging time for you – physically, emotionally and financially. We are here to help you and guide you through what can be a complex legal process. Please call us today for a free consultation and comprehensive case evaluation.